The client was looking for an English Conservatory / Garden / Sun Room. Interested in replicating that very English 18th Century look, we decided to use polished cotton chintz. 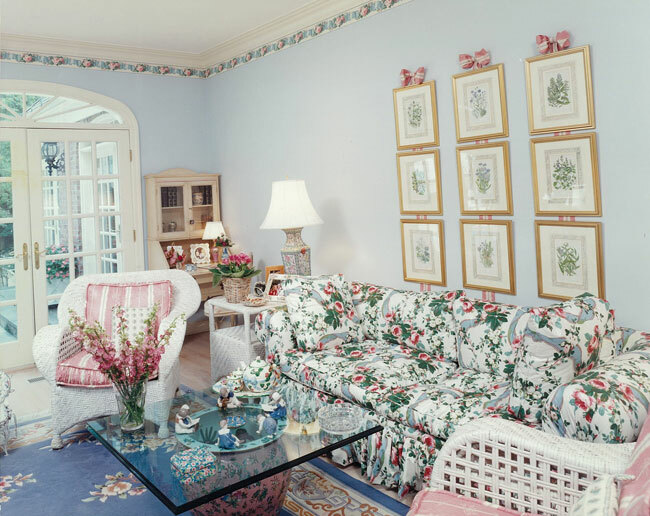 The mixture of wicker, overstuffed down sofas, the Asian inspired jardeniere, and the series of 18th Century authentic botanicals were effective components in the creation of this setting. Originally a sitting room with no personality what-so-ever, and a beautiful /patio view that was completely obstructed by an outside wall, I had my GC blow out the 2 outside walls and put in 2 walls of double French Doors instead. Molding was replaced and I designed a skylight, which unfortunately was missed by the photographer. The linoleum floors were quickly replaced with solid oak hard wood floors that I had pickled, in order to keep the room as close to character as possible. The fabulous solid oak armoire is an Italian Import that was hand painted to compliment the room. The unique Chair-and-a-Half under the ficus tree is an Antique from turn of the Century. It was recovered, refinished, and reupholstered. Room Designs that ALWAYS endure! Copyright © 2007 - 2008. All Rights Reserved.